Many Rolex enthusiasts and collector’s have a few ‘holy grail’ watches that they would like to own, one such being the Rolex British Military Submariner (Model # 5513/5517). These watches are one of the most counterfeited of the collectable Rolexes around, and some are so good that even major auction houses have been fooled on occasion, so be extra careful with his one. I have personal experience in this area and was delighted, if slightly cautious, when an opportunity to own one of these watches came my way. It was well worn and covered in dirt but otherwise looked like a good piece. It had the correct military inscription, the lugs were fixed, the dial was marked with a capital ‘T’ to indicate tritium, the serial number was, as expected, on the inside of the case back, and the general condition indicated that it was anything but a freshly painted and fitted fake. Enthusiastically I went about cleaning the watch up and generally improving it cosmetically but gradually, as I discussed my find with other enthusiasts, my suspicions became aroused and I decided to contact Rolex UK and ask for their opinion. 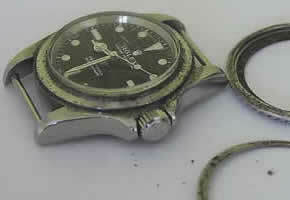 Dirty but very desirable - A Military Submariner? 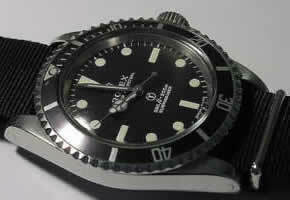 Rolex reported back that my watch had originally been sold as a normal Rolex non-date Submariner 5513 in 1974 in Madrid, Spain! Looking again with a more jaundiced eye I could see some tell tale signs that perhaps I should've spotted first time around (of course it's always easier in retrospect). 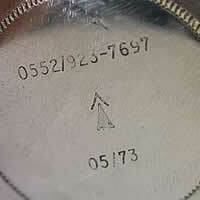 The military inscription was just not quite right and whilst the dial printing looked genuine (for the most part it was! 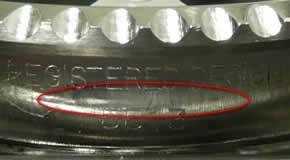 ), the 'T' was not of the same quality under the jewellers eyepiece. Another clue was with the marks around the wrist band fitting. 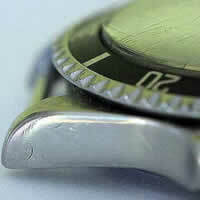 This watch had a fixed lug bar typical of the Military Submariner yet bore the wear marks of having been used with a bracelet? It appeared to be fitted out for use with a strap but clearly had been partnered with a bracelet for a significant period of time (see illustrations below). 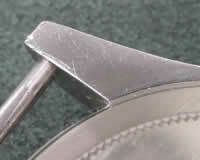 It is of course possible to have watches re-styled for personal preference but it is unusual and worth double checking particularly if spotted on a collector’s piece like this. 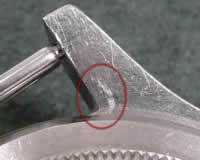 Bracelet marks on the fake. Model No clear and un-marked on the real one. 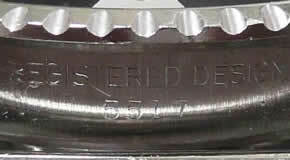 Lugs marked by a bracelet. Clean on the genuine article. As it happens I got a full refund on the dud so it wasn't too painful for me, just very disappointing and a huge waste of time, but it does underline, once again, the value of dealing with reputable sellers if you are interested in collectable watches. As an aside, The Military Watch Resource hosts a very good forum on military timepieces, and watches in general and is a good place to get opinions and perspectives on your prospective purchases from other watch enthusiasts.